Being More Spontaneous…What the Summer has taught me! Summer has well and truly left us and it’s time to get those boots out and embrace Autumn. But, before I say goodbye to summer I have been thinking about the last couple of months and what it has shown me. I never really saw myself as someone that lives to a routine, yes I like to be organised but not in the sense that our weekends are all mapped out weeks in advance. Having children has brought routine into our life because children thrive on routine. They like to know what is coming next, they like structure and when they are little they need to be fed and have naps at set times. And lets be honest no one likes to be around an overtired hungry child. But as the girls are getting older and life is starting to get a bit easier we can start to be a bit more spontaneous. It’s also not just about being spontaneous its about doing things that go against all the parenthood rules. Who makes these rules anyway! This summer we’ve been doing things that we wouldn’t have thought about doing before and really there is no reason why we couldn’t have done. The evening before Alice’s birthday for an early birthday treat, we went and had fish and chips at the park for dinner. Andy had been working from home and therefore was ready earlier, as he had no drive home. We picked the fish and chips up on our, laid out a picnic blanket and ate our dinner. It was the perfect early start to Alice’s birthday and afterwards the girls played in the park before we came home for bedtime. The girls only went to bed twenty/ thirty minutes later than normal, which isn’t much and it was worth it as we all had lots of fun. We took the girls to Peppa Pig World for their birthday’s and when we’ve been before we have always made sure we left in time to get home for dinner and bed. Crazy really when I think about it now, but I think we just got so used to their routine that we didn’t think to do anything different. This time it got to late afternoon and it was still a gorgeous sunny day, we still had rides to go on and we were having a brilliant time. We didn’t want it to end. So we stayed later, had some dinner and then went home. I thought the girls might fall asleep on the way home, but they luckily they didn’t and we got home and popped them into bed. Yes, the girls were a little it more tired and grumpy the next day, but that’s ok. We all need quieter days at home to get to back on track and it’s totally worth it. 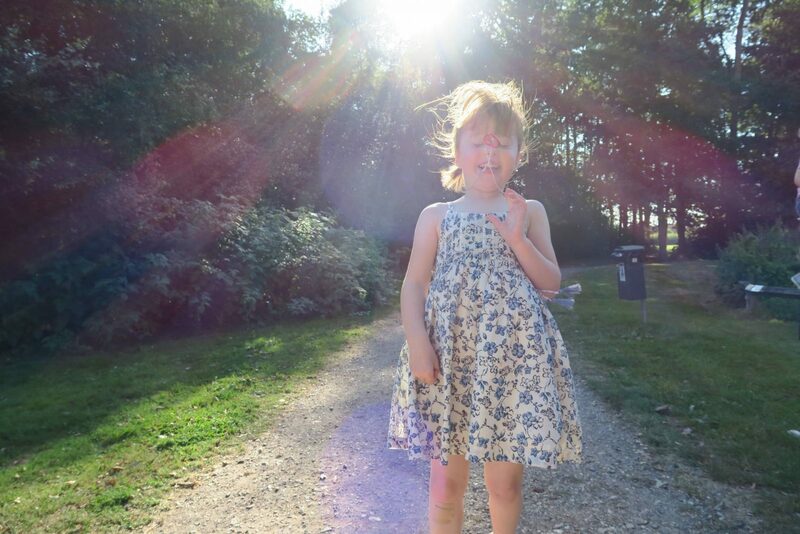 As we came to the end of what has been a brilliant summer, except the chicken pox. This summer has taught me to be a bit more spontaneous, to throw caution to the wind and to not worry as much. Life is short and my girls are growing up so fast that I want to make the most of every minute. With Alice starting school, our life is going to be filled with even more routine. But, that only gives me even more reason to be a bit more spontaneous at the weekends and during the school holidays. Do you stick to a routine every day or do you sometimes go against it? I’m terrible at being spontaneous! But my husband is my opposite and so he forces me to be every now and again and I have to admit that I love it! Love days out where you stay out late and have dinner out and late to bed – so many happy memories are created that way! Oh we used to be spontaneous, but with adopted kids, spontaneity and surprise are big no no’s! We’ve grown used to routine as we know the kids need it and thrive on it and our lives are so much easier with it. But hey all to you being spontaneous! Go for it and enjoy! One day we’ll be spontaneous again! I am very much a planner but my husband is the opposite so we’re forced to compromise sometimes! Ah, I really liked this. It was bittersweet for me, because I always had very firm routines (bath, book, bed by 7) and you are right, young kids really do thrive when their day is quite structured. However, now my boys are 11 and 9, there is no real structure any more and your post made me look back on those days when they were little, and how much I miss it sometimes! That said, spontaneity is so much fun – and kids love that, too! You had a great summer! I stick to routines at the moment as my son is just 18 months but really can’t wait for the spontaneous days like yours! It’s way more fun! That’s a fab thing to learn! I love being spontaneous, I’m really not one for routine at all. I could probably learn a lot from you being organised but it’s just not me and I think it’s great to have a balance between routine and spontaneity. Aww it sounds like you had a good summer bar the chicken pox of course! Being spontaneous is something I need a little more of. I agree this summer has taught me to loosen up on the routine too, go with the flow so to speak.